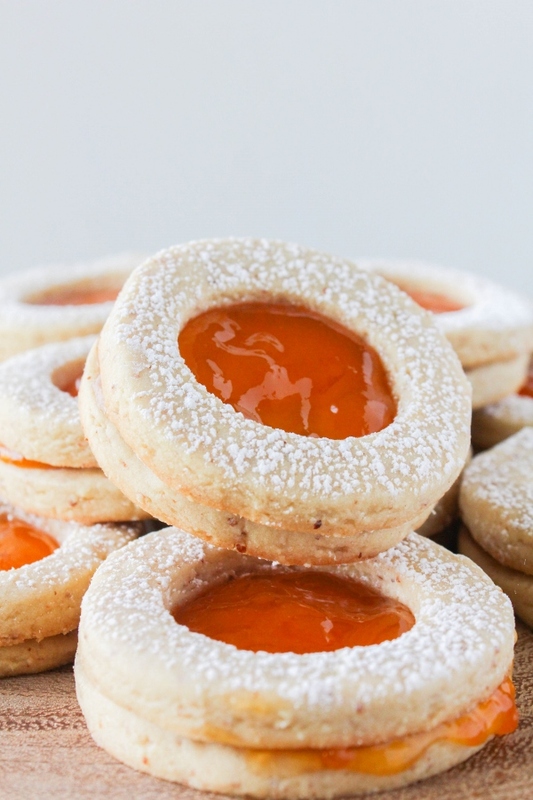 These beautiful, buttery almond shortbread cookies are sandwiched between a light and fresh apricot jam. These classic Linzer cookies are perfect for any of your spring special occasions! Spring has sprung and with it comes a couple of my favorite special occasions - Easter and Mother's Day! I celebrate both days with my family and love to host dinner and serve light and fresh dishes. 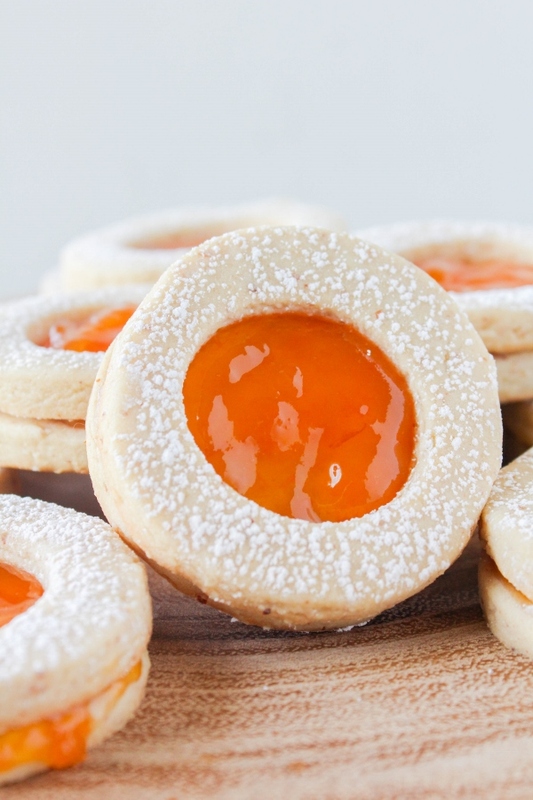 Of course we can't forget about dessert, and these Apricot Linzer Cookies are at the top of my baking list! Linzer cookies are a classic cookie, originating in Austria. They are typically made during the holidays, but I love to make them all year round for special occasions. While the recipe has a few steps, it's nothing too difficult and the cookies are absolutely worth it. The dough is similar to shortbread, but I add ground roasted almonds which makes the cookies crispy and gives them another layer of of flavor. 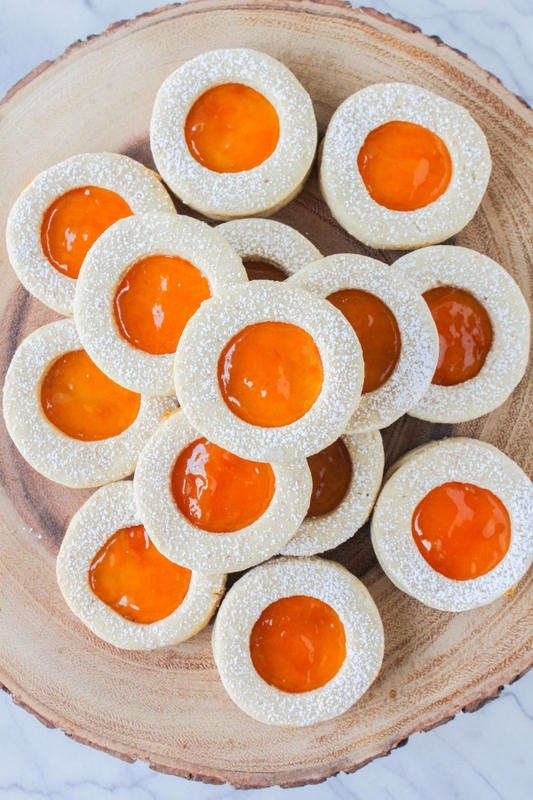 Cutting out a small circle in the center of half of the cookies give them a little "window," perfect for the apricot jam to peek out. The finished sandwich cookies are as delicious as they are beautiful. Another thing I love about these Linzer cookies is how versatile they can be. Depending on the occasion you can change up the shapes using heart cookie cutters, fluted round cutters, even squares. You can also use your favorite jam - raspberry, strawberry, peach.... Get creative! In a food processor, process the almonds until they are finely ground. In a medium bowl, whisk together the ground almonds, flour, baking powder and salt. In the bowl of a stand mixer, beat the butter and sugar until light and fluffy. Add in the egg and then the vanilla. Gradually add the flour mixture to the wet ingredients, mixing until just combined. Divide the dough in half and shape into two rounds. Wrap them in plastic wrap and refrigerate until firm, about 2 hours. On a lightly floured surface, roll out each round of dough. Using a 2 1/2-inch round cookie cutter, cut the dough into rounds and place on the prepared baking sheets. Using a 1-inch round cookie cutter, cut out the centers from half of the cookies. Re-roll the scraps as necessary and continue cutting out rounds. Bake the cookies for about 12 minutes, or until the edges are golden brown. Cool slightly on the baking sheets, then transfer the cookies to a wire rack to cool completely. Sprinkle the powdered sugar on the cookies with the holes. 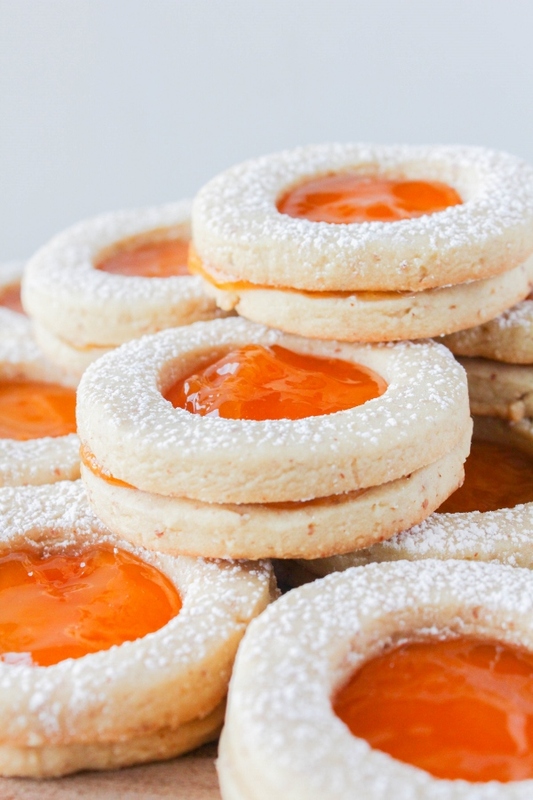 Spread a teaspoon of jam on the remaining cookies and top with the sugared cookies. Store the cookies in an airtight container or cookie jar.